Sepsis is a multisystem disease and is associated with significant morbidity and mortality. Acute kidney injury (AKI) is a relatively common complication in septic children and is a major cause of death in these patients. While serum creatinine is the gold standard for the diagnosis of acute kidney injury, it has many drawbacks. Cystatin C has emerged as a biomarker for AKI. We aim to assess if serum cystatin C can predict early AKI in septic children. This is a cross sectional study conducted in King Abdulaziz University Hospital. Patients who were suspected of being septic were eligible for inclusion in the study. Both serum creatinine and serum cystatin C levels were measured in patients on admission (0h) and 12h after admission. AKI was diagnosed according to the modified pRIFLE criteria. 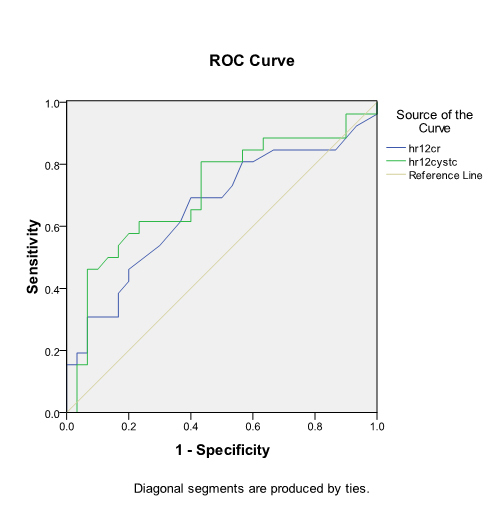 Receiver operating characteristic (ROC) curve analysis was used to assess whether cystatin C is a useful biomarker for diagnosing early AKI in children with sepsis. A total of 40 patients with sepsis were included. Twenty-eight patients were diagnosed with AKI (70%). Serum cystatin C was significantly higher in patients with AKI (1595.79 ± 303.830) compared with patients without AKI (1344.67 ± 378.23) with p=0.033, and the mean difference was 250.119 [95% CI, 478.60 to 21.637]. The area under the curve (AUC) for serum cystatin C suggested it was a good marker for the diagnosis of AKI with a sensitivity of 92% and a specificity of 66.7% at 0 hours and a sensitivity of 90% and specificity of 75% at 12 hours. The best cut-off value was 0.721 mg/l. There was no significant difference in the AUC curves for serum creatinine and serum cystatin C at 0h and 12h (p-value of 0.2 and 0.3, respectively).While serum cystatin is a sensitive and specific marker for the early diagnosis of sepsis-associated AKI, it is not superior to serum creatinine. Sepsis is a multisystem disorder that affects vital organs, is a common cause of admission to the intensive care unit and is associated with significant morbidity and mortality . Acute kidney injury (AKI) is relatively common in septic children and considered one of the major leading causes of death in these patients . Large proportion of patients with sepsis associated AKI will need renal replacement therapy . Early diagnosis of AKI is vital, and early intervention and prompt implementation of therapeutic measures save lives. Currently, multiple urine and serum biomarkers have emerged for the early diagnosis of AKI including cystatin C , neutrophil gelatinase-associated lipocalin (NGAL) , IL-18 , and Kidney Injury Molecule 1 (KIM-1). However, each of these biomarkers has drawbacks, and results from clinical studies regarding the usefulness of these biomarkers are conflicting. Research is therefore still ongoing in an effort to identify the ideal biomarker for the early identification of AKI. Cystatin C is a 13-Kd protease inhibitor that is essentially produced by all nucleated body cells. It is freely filtered in the glomeruli and is catabolized by proximal tubular cells. Furthermore, cystatin C is increased in the urine and serum upon renal damage . Results from several clinical studies have suggested that urinary and serum cystatin C are potential biomarkers for the early diagnosis of AKI. These studies evaluated patients admitted to the intensive care unit , emergency department , and post-cardiac surgery unit . Cystatin C is also correlated with serum levels of C-reactive protein in patients with AKI and may be an ideal marker for the early diagnosis of sepsis-induced AKI . In this study, we aimed to assess whether serum cystatin C is a useful biomarker for the early diagnosis of AKI in pediatric patients with sepsis. This was a prospective cross sectional study of children admitted to the Pediatric Intensive Care Unit (PICU) at King Abdulaziz University Hospital, Jeddah, Saudi Arabia from September to December 2013. The study was approved by the Biomedical Ethics Research Committee of King Abdulaziz University. All patients/caregivers signed a detailed and informed consent prior to inclusion in the study. patients who had received nephrotoxic medications. We collected demographic data, medical histories, and reasons for admission to the PICU, diagnoses, fluid balance information, anthropometric measurements, laboratory test results, and data on the need for renal replacement therapy. The modified pRIFLE criteria were used to diagnose AKI. Serum cystatin and serum creatinine levels were measured at the time of admission (0h) and 12 hours after admission (12h). Patients were classified into the following categories: 1) a risk stage, if the GFR decreased by 25 % and/or UOP<0.5 mL/kg/h for 8h; 2) an injury stage, if the GFR decreased by 50% and/or UOP<0.5 mL/kg/h after 16h; and 3) a failure stage, if GFR decreased by 75% . We defined the baseline criteria as the last serum creatinine measured, and for the patients with no previous serum creatinine, we calculate their average GFR according to their age . The estimated glomerular filtration rate (eGFR) was calculated using the bedside Schwartz formula . The following statistical analyses were performed using IBM SPSS statistics version 20.0. To test for the normality of distribution, we used The Shapiro-Wilk test. For descriptive data, we reported the mean and standard deviation, median, and quartiles. We used Chi-square test to determine whether there was any relationship between the categorical variables and AKI status. To assess whether serum cystatin C was an accurate biomarker for the early diagnosis of sepsis-related AKI, we used receive the receiver operating characteristics curve (ROC). The Hanley method was used to compare the ROC for serum creatinine and cystatin C.
We used the traditional Jaffe kinetic method to measure serum creatinine. The main disadvantage of this method is the lack of specificity because the presence of other chromogenic material decreases the accuracy of the test and can potentially give false results. The serum cystatin C level was measured using an ELISA kit, and the reference interval was calculated and determined to be 0.53-0.95 mg/L The main disadvantage of ELISA is the presence of turbidity and small particles, both of which can affect the accuracy of the test. A total of 40 patients were recruited in the study. There were 22 females and 18 males. The median age of the patients with AKI was 27 months with an interquartile range of 8 to 46 months. For patients without AKI, the median age was 32 months with an interquartile range of 15 to 49 months. Based on the modified pRIFLE criteria, 28 patients were diagnosed with AKI. They were classified as followed: 14 (50%) patients were in the risk class, 6 patients were in the injury class (25%), and 7 patients were in the failure class (25%). Blood cultures were positive in 24 patients with AKI (85.7%) and in 10 patients without AKI (83.3%). The most common bacterium was staph epidermis that was found in 8 (29%) patients with AKI and in 4 patients without AKI (33.3%). Urine cultures were positive in 14 patients with AKI (50%) and 8 patients without AKI (66.6%). E. coli was the most common bacterial pathogen and was found in 5 (17.8%) patients with AKI and 3 patients (25%) without AKI. The cerebrospinal fluid culture was positive in a single patient with AKI (Table 1). Table 1. Demographic data for both patient groups: acute kidney injury (AKI) and non-acute kidney injury (non-AKI). Serum levels of cystatin C was significantly higher in patients with AKI (1595.79 ± 303.830) compared with patients without AKI (1344.67 ± 378.231). The variance was equal between the two groups (t(38)=-2.216, p=0.033), and the mean difference was 250.119 [95% CI, 478.60 to 21.637 ] (Figure 1). Figure 1. 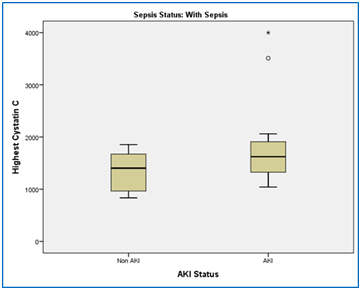 This box plot to compare the mean of serum cystatin C in AKI patients comparing to non-AKI patients with sepsis. By using students t-test, the mean of Serum levels of cystatin C was significantly higher in patients with AKI (1595.79 ± 303.830) compared with patients without AKI (1344.67 ± 378.231), p-value=0.033. At 0 hours: For creatinine, the area under the curve (AUC) was 0.917 with a 95% confidence interval (0.77, 1.000). For cystatin C, the area under the curve (AUC) was 0.889 with a 95% confidence interval (0.725, 1.000). The difference in AUC was not significant (p-value of 0.3). For serum creatinine using a cut-off of 32 µmol/l, the sensitivity and specificity were 95% and 72.2%, respectively. For serum cystatin C using a cut-off of 0.721 mg/l, the sensitivity and specificity were is 92% and 66.7%, respectively (Figure 2). Figure 2. To compare the ability of serum cystatin C to serum creatinine for AKI diagnosis at 0 we use ROC analysis and showed serum cystatin C at 0 had a sensitivity of 92% and a specificity of 66.7% with a cutoff 0.721 mg/l, while serum creatinine had a sensitivity of 95 % and a specificity of 72.2% with a cutoff value of 30 umol/l.The difference between ROC curses was not siginificnat indicating serum cystatin C was not superior to serum creatininefor sepsis assocated AKI ( p-value of 0.3). At 12 hours: For creatinine, the area under the curve was 0.951 with a 95% confidence interval (0.849, 1.000). For cystatin C, the area under the curve was 0.819 with a 95% confidence interval (0.635, 1.000). The difference in the AUC was not significant (p-value of 0.3). For serum creatinine, the best cut-off was 32 µmol/l, and the sensitivity and specificity were 93% and 78%, respectively. For serum cystatin C, the best cut-off was 721 mg/l. The sensitivity and specificity were 90% and 75%, respectively (Figure 3). Figure 3. To compare the ability of serum cystatin C to serum creatinine for AKI diagnosis at 12h we use ROC analysis and showed serum cystatin C at 0 had a sensitivity of 90% and a specificity of 75% with a cutoff 0.721 mg/l, while serum creatinine had a sensitivity of 93 % and a specificity of 78% with a cutoff value of 30 umol/l.The difference between ROC curses was not siginificnat indicating serum cystatin C was not superior to serum creatininefor sepsis assocated AKI ( p-value of 0.3). In this cohort, we found a high incidence (70%) of acute kidney injury among sick children diagnosed with sepsis. This finding is similar with results from other cohorts of patients with sepsis in whom AKI is reported to be a common complication [18,19]. It is well known that the presence of AKI is associated with an increased risk of death. In another study conducted at King Abdulaziz University Hospital , we reported that severe AKI in the failure class increased the risk of death. In the same study, we have found that hypervolemia, the use of mechanical ventilation and the need to initiate renal replacement therapy were also associated with a higher risk of death. Early diagnosis and prompt implementation of therapeutic measures to manage AKI is essential in septic patients and can decrease mortality and morbidity. In this study, we demonstrated that serum cystatin C can function as an early diagnostic predictor of AKI in septic children. This finding is consistent with other clinical studies. In a cohort of 151 patients, Aydogdu et al showed that both serum and urinary cystatin C are accurate biomarkers for sepsis-associated AKI with area under curve (AUC) values of 0.82 and 0.86 and a cut-off value 1.5 and 0.106 mg/L, respectively . Another study by Nejat that included 444 patients admitted to the intensive care unit showed that urinary cystatin C served as an independent biomarker for the prediction of AKI, sepsis, and morality .Similarly in a study in Spain, cystatin C was more reliable than serum creatinine in prediction of AKI in septic patents and correlate with mortality rate at 30 days after admission . Interestingly, cystatin C has been shown to be a good diagnostic marker for contrast-induced nephropathy in septic patients. A clinical study conducted in Saudi Arabia  showed that serum cystatin C was significantly higher in septic patients with contrast-induced nephropathy. In contrast, cystatin level was a poor diagnostic marker for AKI resulting from other diseases such as hypertension, diabetes mellitus or ischemic heart disease. The accuracy of serum cystatin C in the early diagnosis of sepsis-associated AKI also been demonstrated in animal models. Asada et al. reported that serum cystatin C was superior to serum creatinine in the early diagnosis of AKI resulting from cecal ligation and puncture (CLP)-induced sepsis in CD-1 mice. Another interesting clinical study  demonstrated that elevated serum cystatin C, independent of an abnormal GFR, may potentially be associated with an increased incidence of community- acquired sepsis in patients >45 years old. However, other studies failed to show a relationship between serum cystatin C and sepsis or sepsis-associated AKI. Other clinical studies failed to show any impact of sepsis on cystatin levels. In a cohort  of 388 patients, and showed that the level of cystatin C did not discriminate between septic and non-septic patients with no renal damage. Even in patients with AKI, there was no significant difference between septic and non-septic patients, which implied that sepsis and inflammation have no effect on the metabolism of cystatin C.
A study that involved neonates  reported no significant difference in levels of cystatin C between patients with sepsis compared with patients without sepsis. All patients exhibited normal kidney function. Based on the combined results of the above-mentioned studies, additional investigations are needed to better define the role of cystatin C in the diagnosis of sepsis-associated AKI. Neutrophil gelatinase-associated lipocalin has emerged as another promising biomarker for the early AKI prediction and sepsis. Baghshay et al. , in a prospective cohort of b3 patients (43 with AKI), showed that both plasma and urine NGAL were significantly higher in septic patients with AKI compared with non-septic patients with AKI. To our knowledge, this is the first cohort in Saudi Arabia to assess the diagnostic role of cystatin C in the early diagnosis of AKI in septic children. 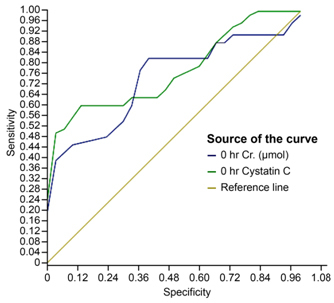 While cystatin C is a sensitive and specific marker for the early diagnosis of sepsis-associated AKI, it is not superior to serum creatinine. There are several limitations to this study: 1) it is a single center study and includes a relatively small group of patients; 2) the study only included patients with sepsis; however, the inclusion of patients without sepsis would further enhance our understanding of the relationship between sepsis and levels of cystatin C; and 3) it was beyond the scope of the study to address factors that can affect levels of cystatin C level such as serum insulin , steroid therapy , and hypothyroidism . KDIGO (2012) Clinical Practice Guideline for Acute Kidney Injury. Kidney Int Suppl 2: 8. Legrand M, Jacquemod A, Gayat E, Collet C, Giraudeaux V, et al. (2015) Failure of renal biomarkers to predict worsening renal function in high-risk patients presenting with oliguria. Intensive Care Med 41. ©2016Safdar OY. This is an open-access article distributed under the terms of the Creative Commons Attribution License, which permits unrestricted use, distribution, and reproduction in any medium, provided the original author and source are credited.